The night's hunt had been very successful, so Bowflight returned to the Holt with high spirits. They had not only killed a large boar, but on the top of it he had shot down two ravens, which wanted to feed themselves from the kill. Now the remnants of the two birds dangled from his belt and he knew already what he wanted to do with them. His beautiful lifemate, Finch, loved feathers and he would make a necklace with black feathers for her. 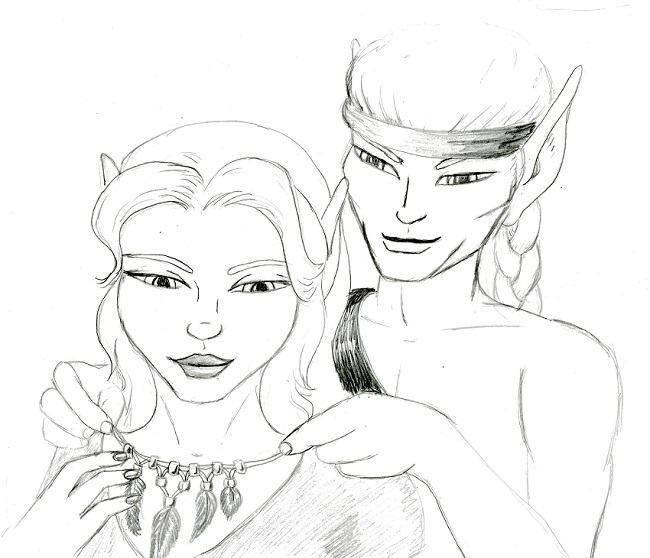 He smiled as he imagined the delighted sparkle of her wonderful amber eyes when he would give her his gift. The successful hunter picked up his pace as he looked forward to this moment. The night was still young and he had some work to do before he could give her his gift.